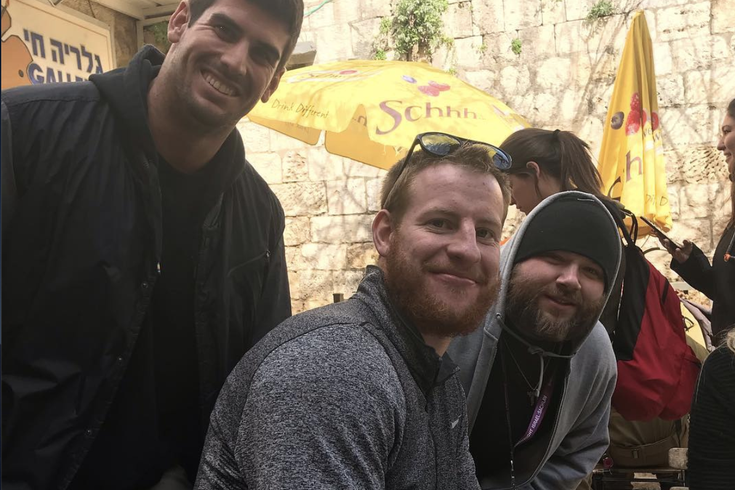 Carson Wentz in Jerusalem, with Aaron Brodsky and Eric Adelman. A lot of NFL players are known to do some traveling in the offseason. Eagles quarterback Carson Wentz appears to have traveled further than most. The Birds' quarterback was spotted in Israel earlier this week and photographed at a restaurant in Jerusalem, while sporting a slightly longer beard than the one he typically wears. Two men who are in the country on Birthright Israel trips recognized the quarterback and posed for a picture with him. Aaron Brodsky, who uses the Instagram handle @mypicturesarecool, posted the photo first. "Idk how the hell i ran into him in Jerusalem but thank you @cj_wentz11 for not punching me in the face for bugging u while u wer eating go eagles!," Brodsky wrote, adding tags for the Eagles and for Birthright Israel. Brodsky, who lives in East Falls, performs rap music under the name Aaron Out, and made some news back in 2017 when his song "Wawa Hoagies" went viral, and was later featured on The Tonight Show. "I did not ask him much at all because I did not want to bother him anymore than asking for a picture," Brodsky told PhillyVoice of his encounter with Wentz. "I was very nervous and in disbelief to see him all the way in Israel since I’ve never even seen him in Philly." He added that his group had just visited a Holocaust museum, so running into Wentz was "very uplifting" after such a heavy experience. The other man in the photo, Eric Adelman, is a Patriots fan who lives in Florida. He posted the photo to Facebook, noting that he "couldn't resist a pic even though they took a ring from the Pats." The picture was taken on Sunday, Adelman told PhillyVoice, at a cafe in the Old City of Jerusalem. Wentz was eating with his wife and parents. "We just spoke briefly with him because he was eating and didn't want to bother," Adelman said. "Aaron is from Philly and a huge fan so he told him then and congratulated him on getting a ring." Brodsky, Adelman said, had even brought a Wentz jersey with him to Israel, for use in a Purim costume later this week. The Facebook account for Birthright Israel posted the photo, complete with the painful pun "Guess who WENTZ to Israel?!" NFL players' visits to Israel have caused controversy in recent years. An organization called American Voices in Israel has taken a delegation of NFL players to the Holy Land in February or March of each of the last few years. On the 2017 edition of the trip, several players- including ex-Eagle Michael Bennett- pulled out at the last minute, with Bennett proclaiming that he felt he had been "used" by the Israeli government. Mychal Kendricks, who was then with the Eagles, went on the 2017 trip. Seven players made the trip in 2018, although the excursion was kept "under wraps" until the players landed, according to the Jewish Telegraphic Agency. There have been no media reports about a 2019 edition of the trip, and the Eagles say Wentz is not in Israel as part of American Voices in Israel, but declined to comment further. Wentz, who is a devout Christian, has not made any posts to his social media accounts in regard to his travels his week, indicating that the trip has been kept low-profile. However, several Eagles fans who live in Israel have seen the picture and tweeted at Wentz, asking to meet him. Assuming Wentz is still in Israel, he was also out of the country for the news that his onetime hunting buddy, Mike Trout, won't be coming to play in Philly. Carson Wentz is not the only Philadelphia luminary to visit Israel in recent months. 6ABC anchor Jim Gardner took a trip to the Holy Land in December, where he was photographed atop Masada with none other than Jeopardy host Alex Trebek. Gardner also tweeted a picture of his laptop, which he was using to watch that week's Eagles game while traveling in the Galilee region.